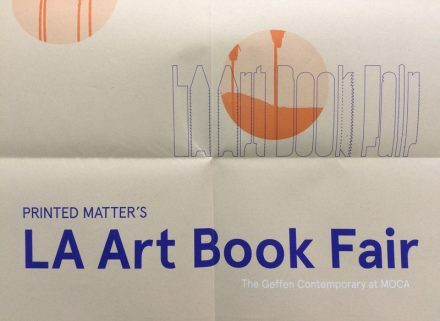 »Free and open to the pub­lic, Prin­ted Matter’s LA Art Book Fair is a unique event for artists’ books, art cata­logs, mono­graphs, peri­od­ic­als, and zines presen­ted by over 300 inter­na­tion­al presses, book­sellers, anti­quar­i­ans, artists, and inde­pend­ent pub­lish­ers. Prin­ted Matter’s LA Art Book Fair 2016 saw over 35,000 vis­it­ors over the course of three and a half days. Prin­ted Matter’s LA Art Book Fair is the com­pan­ion fair to Prin­ted Matter’s NY Art Book Fair, held every fall in New York. In Septem­ber 2016, over 39,000 artists, book buy­ers, col­lect­ors, deal­ers, cur­at­ors, inde­pend­ent pub­lish­ers, and enthu­si­asts atten­ded Prin­ted Matter’s NY Art Book Fair.